This member of the Escher gang was definitely may favorite of the bunch. As soon as I saw the power whip, I thought that I could do some fun Object Soucre Lighting! Since the whip wrapped around the figure, it meant that I could spread out the effect much farther than I normally would be able to do. Here is a link to the original live session where I painted a batch of 5 in oil paints. I have just secured some more units (this time Dark Elves) which will be the source of many more tutorials and live sessions. I have been posting more links to special Patreon versions of these tutorials, with more coming this month. 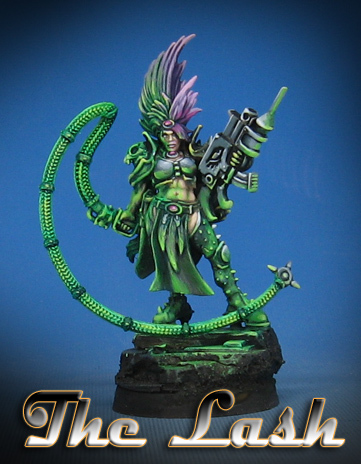 Five have been posted thus far, including the Shaded Basecoat and Glazing videos. I will also be creating more new versions of the Painting Pyramid videos, which will focus on basing, army painting techniques, oil paints, and much more! A $5 pledge is all you need to see those full length 100-200 minute tutorials.